2 for the price of 1 this time - I found these gigs and couldn't resist trying to restore them. Depeche Mode just before they hit the big time. The 1981 gig is a real gem - a gig 2 weeks after New Life, their first single to breach the charts, was released. I think this was a soundboard recording, its polished up really well - an exciting, raw performance with nothing but a reel to reel tape recorder and analogue synths. Its rather short so I broadcast it along with an even earlier gig I found - one of their gigs from the Bridgehouse in London from October 1980, several months before the release of their first single, "Dreaming of Me". This one is an audience recording and had been "restored" by someone already to remove tape hiss - not too well. So while I was able to make it pretty listenable, its not the same audio standard as the main show, hence it being a bonus here and not the main show. Even so, its fascinating and still entertaining to hear DM play several unreleased tracks and early versions of other songs which would become well known later. Thanks for the 2 for 1 Flip, much appreciated. Hi again, I really love your posts - would be very greatful if you could reupload this one also. Perhaps changing the file name slightly will stop mediafire from blocking it ? Thanks very much in advance. 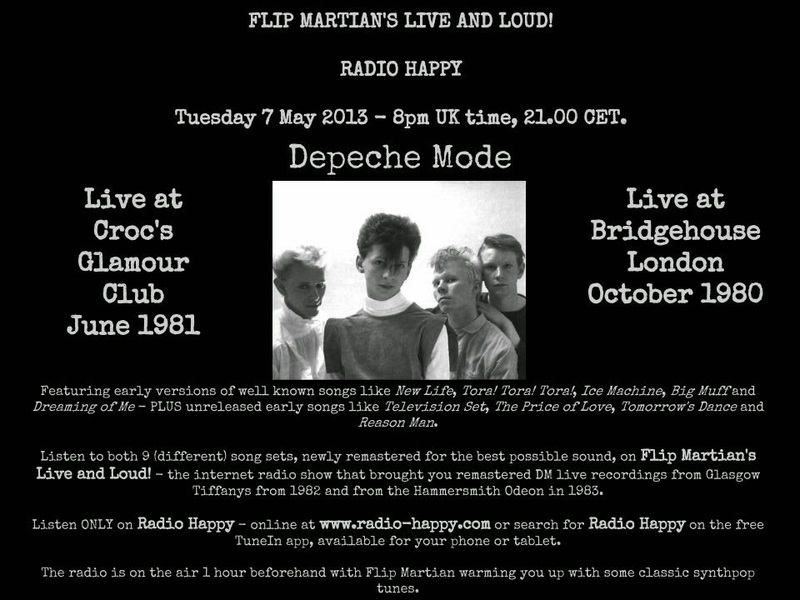 Same as with the OMD show I'm afraid - something the host has done has removed the files on some shows. Will reinstate all just as soon as I've tracked down all the ones that need replacing. Thanks for letting me know!